What It Is: I’m in a fashion-y mood as of late – between last week, this week, and next week’s post you’ll have plenty of fashion inspiration. Today’s comes from a U.S.-based tee shop called Arquebus Clothing, which totes itself as creating minimalistic, universally wearable yet expressive designs. Bit of a mouthful, but alright. Their designs are often available across a range of styles – from slouchy sweaters like you see above (perfect for tossing on over shorts or a swimsuit while at the lake this summer) to guy’s tees to ladies’ tanks and more. A lot of their styles have a slightly vintage edge or inspirational vibe to ’em. Take a browse for yourself! Who It’s For: Your brother, as a birthday gift he’ll actually appreciate. Your spouse, who’s always complaining about not having enough fun, casual clothes. Your best friend, as cool gift that will feel almost one-of-a-kind. 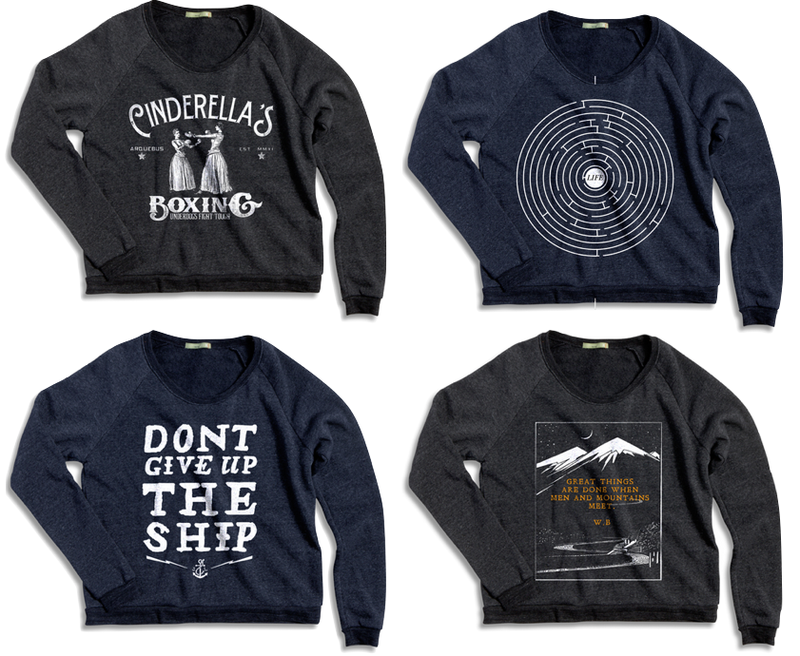 What It Costs: The sweatshirts above are $40 USD, tanks and tees are under $30 USD – shipping varies. Where It’s At: The Arquebus Clothing website. Speaking of cool ways to upgrade your wardrobe – did you see my timi & leslie diaper bag post? Ah-mazing right? Now if you want to nab an extra entry into that awesome draw, tell me in the comments below, what’s your fave piece from the Arquebus Clothing site? I really like these. I like the Smallest Deeds are better than the greatest intentions t-shirt. My face piece from their site is Cinderella’s boxing grey tank! (I’m not in the draw for the diaper bag – just wanted to comment). I like the Shine T-Shirt – thank you! Love the Liberty and Justice grey hoodie. I like the Deeds Make the Man Sweat. I like the Cinderella’s Boxing hoodie. I like the don’t give up the ship. i like the ASPIRE – LADIES SLOUCHY FLEECE sweatshirt! I like the Shine T-shirt in Gray.